Kim has always been an artist. Growing up in the theater, with a cartoonist father to draw with, her life has been lived in a world constantly filled with art. An accomplished actress, Kim moved to New York after college and worked on the production side of theater and film for awhile until deciding to move back to her home in the Dallas/Ft. Worth area. Until recently, Kim’s art career consisted of making various pieces of painting and sculpture for friends and family for special occasions. However, one of these gifts, a cigar band collage mosaic of William Shakespeare, found its way on to social media and received an overwhelmingly positive reception. She soon started receiving commissions. 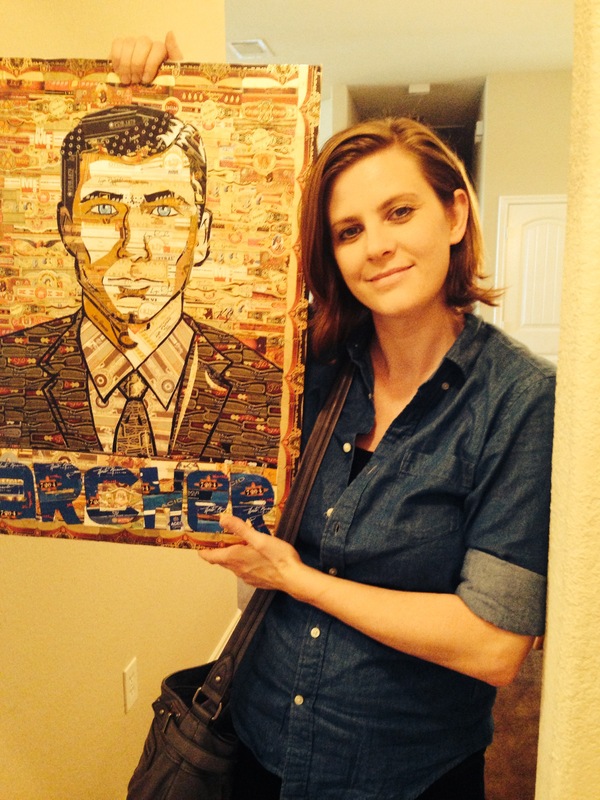 Her second piece, the televisions character Archer, made its way to the #1 post on Reddit’s cigars and Archer pages. Since then, business has been steady and she has started working on her first series of non-commissioned pieces, famous cigar smokers. The first in the series, Alfred Hitchcock, is currently on display. So, Kim plans to branch out and showcase her work in paint and sculpture as her art career continues to grow and develop. Beautiful work, you are a very talented artist and I love your style! Your work is absolutely breathtaking! Majestic in all its glory! Wow such a unique approach! These are beautiful!